12 Did Valerie Jarrett help recruit Van Jones? Valerie Bowman Jarrett (born November 14, 1956) served as senior advisor to U.S. president Barack Obama. She was Assistant to the President for Intergovernmental Affairs and Public Engagement, and Chaired the White House Commission on Women and Girls. Prior to her current position, she served as Co-Chair of the Obama-Biden Presidential Transition Team, and Senior Advisor to Obama's presidential campaign. She was also a Director of the Federal Reserve Bank of Chicago. 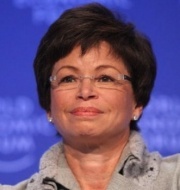 Valerie Jarrett was born in Shiraz, Iran to American parents, James E. Bowman and Barbara Taylor Bowman. She spent the first five years of her life in Iran before her family moved to London. Following a year in London, the family moved to Chicago’s elite neighborhood, Hyde Park. In 1983 she married Dr. William Robert Jarrett, son of famed Chicago Sun-Times reporter Vernon Jarrett, and his wife Fern Jarrett. They were divorced in 1988 and William Jarrett died in 1993. The Jarretts and the Bowmans were family friends. Vernon Jarrett was a one time political associate of Communist Party USA activist and Obama mentor Frank Marshall Davis. Valerie Jarrett is the great niece of prominent Democratic Party leftist Vernon Jordan. Her maternal grandfather was Robert Taylor, the first black chairman of the Chicago Housing Authority. After graduating from the University of Michigan Law School, she went to work for Chicago’s first African-American mayor, Harold Washington, whose election many Sixties radicals attributed to themselves. After Washington’s death in 1987, she stayed on under his successor, Richard Daley. In City Hall, she and her colleague Susan Sher recruited Michelle Robinson, then engaged to Barack Obama, and Jarrett quickly melded her way into their lives. Jarrett became the President and Chief Executive Officer of The Habitat Company on January 31, 2007. She had served as Executive Vice President of Habitat for 12 years. Prior to that, Jarrett served for eight years in Chicago government as Deputy Corporation Counsel for Finance and Development, Deputy Chief of Staff for Mayor Richard M. Daley, and Commissioner of the Department of Planning and Development. Before her city government service, Ms. Jarrett practiced law with two private law firms. From 1995 to 2003, Jarrett served as Chairman of the Chicago Transit Board. Jarrett also served as Chairman of the Board of the Chicago Stock Exchange from April 2004 through April 2007. She was a Director of the Federal Reserve Bank of Chicago from January 2006 through April 2007. Jarrett is the chief executive of The Habitat Company which managed Grove Parc Plaza from 2001 until this winter and co-managed an even larger subsidized complex in Chicago that was seized by the federal government in 2006, after city inspectors found widespread problems. Officials at Woodlawn Preservation say the government didn't give them enough money to properly maintain Grove Parc. Habitat's Jarrett declined to comment on Grove Parc in particular but said it is hard to manage something you don't own. However other Chicago developers and housing activists said that federal subsidies can be adequate if managed properly. They said Grove Parc stood apart for how badly it fell into disrepair. Prior to joining the Obama Administration, Jarrett served as a Director of corporate and not for profit boards, including Chairman of the University of Chicago Medical Center Board of Trustees, and Vice Chair of the University of Chicago Board of Trustees. She was a Director of the Local Initiative Support Corporation, The Joyce Foundation, and a Trustee of the Museum of Science and Industry. Valerie Jarrett ran the finances for Obama’s 2004 Senate bid and served as treasurer of Obama's HOPEFUND. Marilyn Katz worked with Students for a Democratic Society. She is a personal friend of Jarrett's. Jarrett served as Finance Chair for President Obama's 2004 run for the U.S. Senate. Jarrett, 51, is CEO of the Habitat Co. — a clout-heavy Chicago real estate firm — and the court-appointed overseer of the city’s massive plan to transform its notoriously decrepit public housing developments. A lawyer by trade, Jarrett has served as Chicago Mayor Richard M. Daley’s deputy chief of staff and planning commissioner, and has chaired the boards of the Chicago Transit Authority and Chicago Stock Exchange. In 1991, Jarrett recruited Obama’s then-fiancée Michelle Robinson, for a job in Daley’s office. But first Jarrett had to pass muster with Obama. They sealed the deal over dinner, and today, Jarrett is a tight family friend and indispensable Obama confidante. She’s well prepared for the treacheries of the Washington Beltway. Jarrett has stood down an array of Chicago characters, like cranky transit riders, vociferous public housing activists and mendacious aldermen. Friend and foe consider her a no-nonsense, astute operative. The first woman at Housing and Urban Development’s helm will need to navigate multiple threats to the American Dream of home ownership: the subprime loan debacle, an affordable-housing crisis and skyrocketing foreclosures, to name a few. Whatever her prescriptions, she’ll have the president’s ear. Then again, Jarrett — who has been called “the other side of Obama’s brain” — may be better suited for a Karl Rove-ian role in the White House. Jarrett has a close, long relationship with both Barack and Michelle Obama. Like the Obamas, Jarrett is a South Sider with deep ties to the University of Chicago. Though she will be part-time, Jarrett will be one of the most visible and powerful African-Americans in the top rungs of the Obama operation..."
In an article by Robert Draper published on July 21, 2009 in the New York Times, Obama stated that he considered Jarrett as family, that she was like a sibbling to him, and that he trusted her completely. He further stated that he trusted Jarrett to speak for him, particularly when dealing with delicate issues, and runs every decision past her. Did Valerie Jarrett help recruit Van Jones? Valerie Jarrett talked about Obama Green Jobs Czar Van Jones at the Netroots Nation Convention on August 12, 2009 . She was highly complimentary and stated "we were so delighted to be able recruit him into the White house" and "we've been watching him...for as long as he's been active out in Oakland". April 3, 2013, at Mason Temple Church Of God In Christ (Headquarters) Memphis, Tennessee. Martin Luther King III, Lee Saunders, Al Sharpton, Valerie Jarrett, Van Jones and more joined a panel discussion on economic justice. This year marks the 45th anniversary of Dr. King’s final act of solidarity. In commemoration of his life and his solidarity, union members, civil rights leaders and community activists are again gathering in Memphis for a series of historic events. On April 3, the community will gather from 7-10 p.m. in the historic Mason Temple at 930 Mason St., Memphis, Tenn. Highlights include entertainment, a panel discussion on economic and racial justice and special remarks from civil rights leaders. 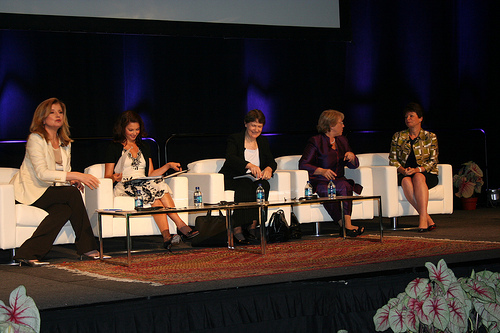 Valerie Jarrett, a top adviser to Barack Obama, addressed the JStreet conference. Jarrett joined Tony Blinken, the national security adviser to Vice President Joe Biden, in a session on the U.S. role in advancing Middle East peace. Jeremy Ben-Ami, the group’s director, had complained in an interview with Jeffrey Goldberg of the Atlantic that only sending Blinken signalled that the administration feared sending a higher-ranking official to the liberal pro-Israel group’s conference, and that it was succumbing to pressure from some centrist and right-wing groups to isolate the lobby. In a statement announcing Jarrett’s participation, Ben-Ami said that along with a video message from Israeli President Shimon Peres and a first-time participation by an Israeli diplomat – deputy ambassador Baruch Binah – Jarrett’s attendance was a sign that JStreet had arrived. “I think it’s clear that J Street has established itself as a permanent and important part of the mainstream American dialogue on Israel,” he said. "Planned Parenthood has a key role to play in access to affordable health care for women, and by extension their access to equality. Yet, Republican leaders in Congress have continued to push to "defund" Planned Parenthood and block women from going there to receive care. That is the opposite of what the White House Council on Women and Girls stood for, and if enacted, would result in millions of women losing access to care." This page was last modified on 7 June 2017, at 02:08.